Statewide, prospective school board members are busy collecting registered voters’ signatures to get on the ballot for November’s election. But in some districts, there are not enough candidates for the open seats. In Arizona, it is the legal responsibility of county school superintendents to fill those seats through appointments. The appointment process is not outlined in state law, but typically includes the county superintendent announcing the vacancies, interviewing people who’d like to serve and making appointments to fill those open seats. 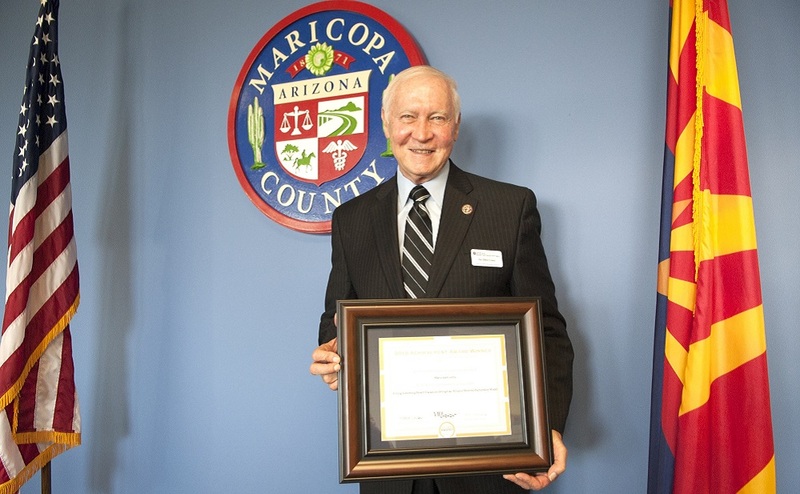 For the past seven years, Maricopa County Education Service Agency, led by county superintendent of schools Dr. Don Covey, has used a process to make those decisions that is based on Stanford University’s collective impact model. Click here for a larger version of this infographic. MCESA developed its model in partnership with Arizona School Boards Association, Arizona School Administrators, Arizona Education Association, Arizona Association of School Business Officials, Stand for Children Arizona and Maricopa County school board presidents and superintendents. 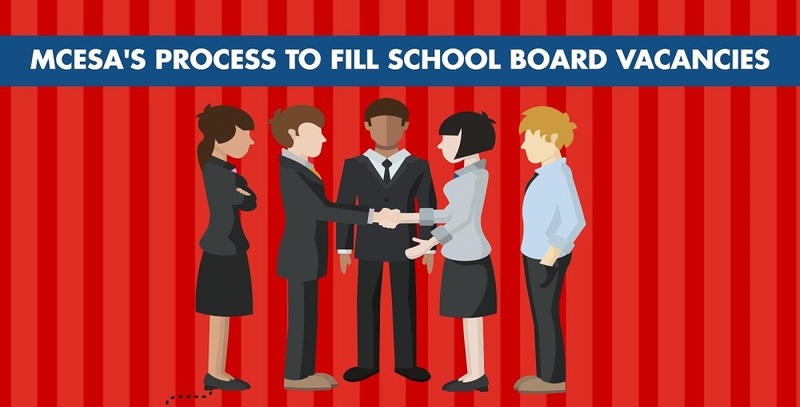 Since 2009, 96 school board members have been appointed using the MCESA model, and many appointees have continued their service by running for election after their initial term ended, Covey said. 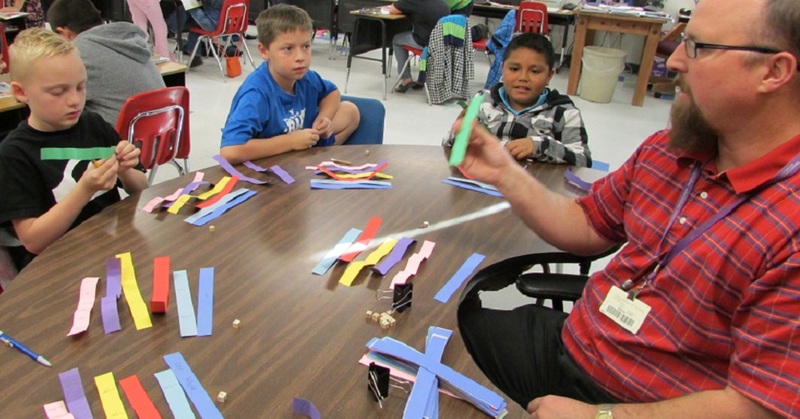 The National Association of Counties honored MCESA’s model with an achievement award in 2015. “This is transparent. It’s open. 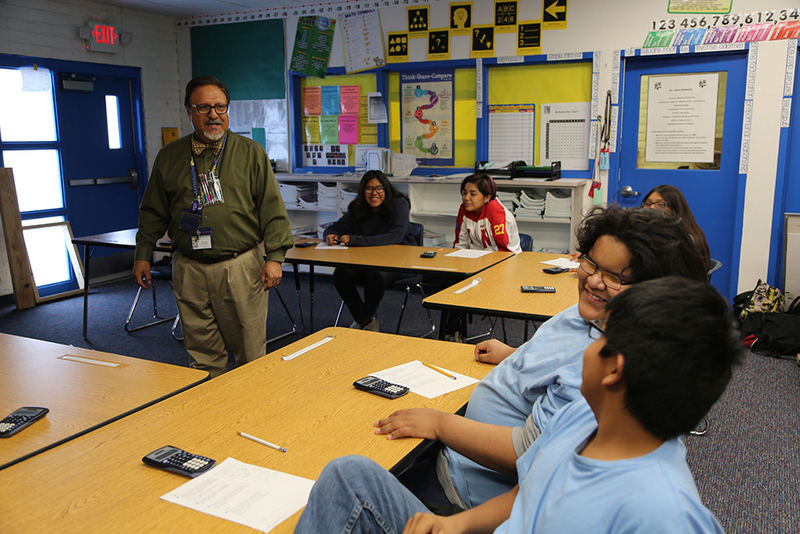 There’s a process that people go through, and we’ve got rave reviews in terms of how they like it,” said Covey, a former Creighton School District superintendent and Arizona Superintendent of the Year. MCESA’s process received an excellent rating from 89 percent of district superintendents, 81 percent of board nominees and 65 percent of board presidents. Thirty percent of board presidents, 19 percent of nominees and 11 percent of superintendents rated the MCESA process as good. While 10 percent of board presidents said MCESA’s process could be improved. Covey said the process is aimed at keeping school boards non-partisan. Covey, a Republican, was elected as county superintendent in 2008 and 2012, and is now running for his third-term. MCESA’s model ensures local control through a timely process that is community-centered, non-partisan and open, Covey said. The process is based on a community-based consensus team which steps in to find people to serve. The team is made up of the school board president, school district superintendent, a teacher representative, a parent representative and two community members. Interested community members, who must meet the basic legal requirements for serving on the board, submit an application to the board president with information about their career, education, community service, home, family, hobbies and recreation and describe how they would help the district accomplish its vision, mission and goals. The team interviews and provides applicants with an orientation including the district’s vision, mission, goals, plans of action to increase students’ academic achievement and success, data evaluating accomplishments and challenges, staff and students learning and working conditions, three years of student assessment data and budgets for the past, current and next fiscal year. The team then ranks and recommends three nominees to the Maricopa County schools superintendent. The nominees and team attend a Saturday seminar facilitated by the Maricopa County schools’ superintendent at MCESA’s office where ASBA, ASA, AEA and AASBO representatives lead discussions on being an efficient, effective board member. “It’s professional development and vetting. When they leave there, they know what their role is. Through that, Don gets a really great sense of who’s engaging and what kind of questions they’re asking,” said Laurie King, MCESA’s director of communications and learning systems. Covey makes the appointment decision after that seminar. The process is also used between regular elections when governing board seats are vacant before a member’s term expires. 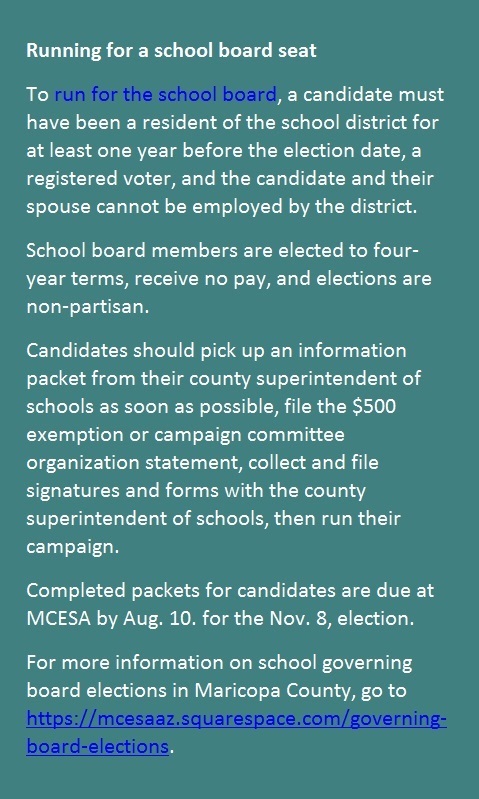 Though county superintendents may call for an election in such cases, doing so is rare because of the cost, which must be paid by the district. 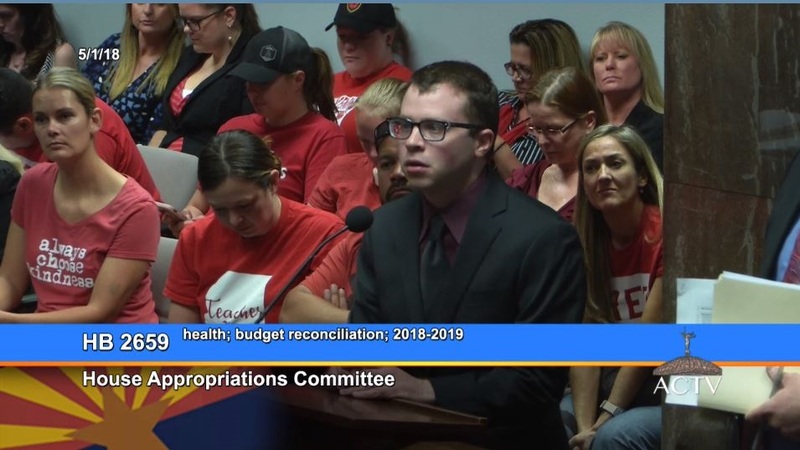 Covey estimated MCESA’s process costs his office $955.82 per appointment – including staff salaries and supplies – significantly less than an election, which costs the average Maricopa County district about $47,838.93. The cost of an election is based on the number of registered voters in the district. Smaller school districts with low students counts often times have very low voter registration as well, and for these districts there may be little to no cost savings, according to MCESA.